As a single mom of 3 young kiddos, building a cabin hasn't been easy, but it sure as hell has been a lot of fun! Hello! Welcome to CabinChick.com! 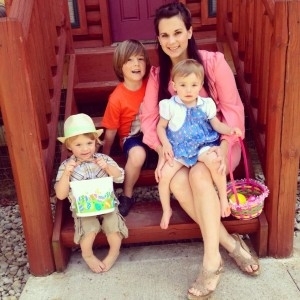 My name is Kelley and my kids affectionately coined the term mommy, "The Cabin Chick" so it just kinda stuck with me. I'm so happy you've found my site and I hope it can provide to you either helpful information, entertainment, some enlightenment, or maybe a little bit of all of the above. As a young mom of 3 kids, I feel I'm always reading something on the internet, either to learn or just escape for a moment so I hope to add some enjoyable content to the sea of the internet and make an authentic impact, however big or small that may be. If you're here because you are considering building a cabin, AWESOME! If you like to just read about other people's cabin-building journeys, that's awesome, too! All are welcome and I look forward to us getting to know each other a little bit more. I have 3 children, currently 7 (Trent), 4 (Casey), and 3 (Norah). Once I had my first child, my perspective and life's meaning changed. I wanted this beautiful life for my child, but I also wanted a beautiful life for me. Up until having my first child, my son Trent, I felt I was doing what you're told you're suppose to be doing. I earned my undergrad degree in Social Work at The Ohio State University, continued on to my Master's, and then went out to find a job. However, I couldn't find a job paying more than $10/hr. I know, I was a social worker, but still, going through a Master's program to then not being able to find at least a decent paying job was more than deflating. However, I was working my way up, so I thought, and playing the role of employee, thinking I was doing whatever it was I was suppose to be doing to get to that place you know you're suppose to go, but not quite sure what and where that place was. Was I happy? I think naively, yes I was. So is naive happiness truly happiness if you don't think you're unhappy? Well, that's for a whole other post (which you can read more about in my blog.) Anyways, fast forward a couple years, I had Trent and my life, as any new parent's life does, changed forever for the good, the bad, the ugly, and the beautiful. Having a stay-at-home-mom for myself when I was growing up, I had a lot of guilt not being able to be there for Trent in the same capacity as my mom was there for me during my childhood. I knew I couldn't afford not to work, but I also couldn't afford to miss so many firsts of my first child. At the time, I was working at a bank as a teller when a customer came in who was an in-home child care provider. I picked her brain and even visited her at her house as to learn how she ran such a business. I crunched some numbers and quickly realized that with only a couple clients, I could quit my bank job, care for children in my home, and be home to care for Trent. For me, this was a no brainer. Within a couple months, I got everything I needed together to then be able to quit my bank job and start the beginning to, what I like to call as my "real life." I founded BungalowBranch. My "real life" consisted of me clearing the smoke and taking the reins to my own life, carving the path to my own real happiness. This concept of staying true to myself and thinking beyond the lines has been the foundational force behind everything I've done since 2008, back when I gave birth to Trent. An unpaved path is a difficult journey, but it's a journey in HD color and surround sound. It's living this kind of life that has given me courage and confidence to overcome the storms and the ability to see the possibilities that live beyond the rainbow. So much have I done, seen, and experienced and it has all culminated to my moment of building a tiny house. Back in 2012, a few weeks before giving birth to my third child, Norah, I became a single mom. Of course this was a difficult time and filled with heartbreak, despair, and emptiness. When you're in a relationship, especially when you're pregnant, you hope to be able to lean on your partner for love and support, however when this is not there, what and who do you lean on? Who can you trust? I am fortunate to have a loving and supportive family and it was my dad who held my hand as I gave birth to Norah. In a dark place, there still bloomed a beautiful moment when the man who made me could hold his daughter's hand as I gave birth to my daughter. It took a couple months to clear the storm clouds from my head, but I had made a conscious choice, ever since having Trent, that my life would not move backward, but forever forward. So what did I need in my life to move forward? I knew adventure, exploration, and nature was what made me feel centered and was what I wanted for my children, so when the opportunity arose for me to be able to buy a 1.3 acre lot on a small lake, I knew in my gut this was the start to a new beginning that I needed; not just for myself, but for the experience of family I wanted to create. I refused to be a defeated parent who would subject dysfunction into her children's lives. So instead of living in dysfunction, I chose to live in possibility. I didn't know when I could build a "real" house on the lot, but I knew owning and having the land to my name was at least the first step to getting to where I wanted to be. As a year past, I was trying to think of a way to use the land, even without there being a "real" home on the property. That's when I came across the Tiny House Movement and Tumbleweed Houses. As I researched more about the tiny houses on trailers, I found that wasn't the best fit for me. I know that building a tiny house on a trailer is a way to skirt building codes etc, however I had land and knew I could build up to 200 square feet without involving the city. So the idea of building a small Lowes shed turned into the "let's do this bigger, better, and cooler" shed/cabin that it is today. As I researched floor plans, layouts, and design ideas, I printed off some graph paper and drew up my idea of what I'd like my cabin to look like. You can download my actual original drawings here. I had only had some home-improvement-project background, a love for design, and that was and has been enough to work with to build the cabin. Some things, such as framing and electrical, I have hired out because safety is most important and I don't want roofs falling down on anyone or fires starting because I wired something incorrectly. So once I had my design, I sought out to find the windows and supplies I needed. I utilized Habitat for Humanity's Re-Store to find most of these supplies. When you're trying to find recycled materials, it takes a bit longer because you can't just order it online or find exactly what you're looking for, but building this cabin wasn't just about having a finished product right away, but the journey that completes the build. The cabin has become more of a dream home that I anticipated. It's modeled after HGTV's Stowe Vermont 2011 Dream Home, so it was always my intention to make it look nice, but having this tiny space in my life has brought a deeper, and shall I say, bigger perspective into my life and makes my smaller home in Bexley now seem more than enough. My children have learned about nature firsthand, as well as tools and what it means to be a kid. I want to protect their childhood and teach them the value of working towards something and to reach a greater goal. But most of all, I want to teach them the value of happiness and how true happiness can only be found from within. From the people, such as Michael Janzen with Tiny House Designs, Lois Parshley with Adventure Journal, Laura Ling with Discovery's Seeker Network, Jim Weiker with The Columbus Dispatch, and the other cheerleaders who have shown my children and I encouragement and love as we navigate through this experience, I thank you from the bottom of our hearts. Maybe it's the social worker, the mom, or the visionary in me, but I hope that my journey continues to bring goodness to those who seek another way, a bigger way, and a more authentic way. My tiny house shares a similar story to others who have also risen from the ashes, so what's the tiny house in your life? Whatever it is, I hope it helps you to live your biggest life possible! To learn more about what I do when I'm NOT working on the cabin, learn more about my business. I'm a family-oriented gal and even my job is centered around my kids because I own a home daycare company, BungalowBranch. Being a home child care provider has allowed be the freedom and flexibility I could not find as an employee and it's my mission to empower women with the same opportunities I live everyday. When Kelley Lewis became a single mom of three, she decided to build her own house. “It was to give my three children and I an opportunity to begin starting over and moving forward,” she said. The 192-square-foot house has become her off-the-grid weekend getaway, complete with front and back porches and a kitchen bar. Through the process, she says, “We have empowered ourselves by learning how do things we never thought we could do. My six year-old can help frame walls, my three year-old can help paint, and my two year-old loves to help clean.” Here’s a few of her insights on moving on and building up. How did you decide to build a house? I became a single parent just weeks prior to giving birth to my third child and wanted to buy something for myself that symbolized a celebration of motherhood, growth, and moving forward. So I purchased a 1.3-acre lot on a lake just west of Columbus, Lake Sylvan in South Vienna, Ohio. When I was able to purchase this piece of property, I didn’t know what exactly I was going to do with this land, but I knew that it would be an oasis to my children and I where we could make memories for a lifetime. Little did I know this piece of land would soon give us the opportunity to build a small cabin that we are making ourselves and working on as a family together. I designed the cabin keeping in mind the building code restrictions in my area, which is a max of 200 square feet. Knowing I was working within a 200 square feet parameter, I wanted a shape that would maximize space, as well as a view. Therefore, our cabin is a total of 192 square feet with a sleeping loft, and front and back porch close to the shore line. The building is 16 feet by 12 feet with 16 foot ceilings, a four-foot front porch and an eight-foot back porch. The sleeping loft has two full sized beds. The downstairs is complete with an open great room, a kitchen with bar, and bathroom with a sink, standup shower, and composting toilet. We will utilize this cabin as a weekend getaway, which in turn has already made us appreciate our small home in Columbus, a home that at 1,100 square feet was feeling small, but is greatly larger than our 192 square foot cabin! Maybe one day we will build an actual house on the land, but for now 200 square feet is all we need. It’s our favorite place to visit and experience life and adventure together as family. How did you learn how to build a house? I had not worked in construction before, but I have had a lot of experience in small home improvement projects. Since I had not built a livable structure, I hired a shed-building company to set the foundation, platform, frame the walls, and get the cabin under roof. With the skeleton in place, I was able to take the project from there. I’m proud to be able to give this experience to my children because, for me, it’s so much more valuable than children playing video games and being in their room all day, not experiencing life and family values. What did you get your materials? All of our windows and a lot of our building supplies have come from the Habitat for Humanity ReStore as well as Craigslist. One of the best experiences in this whole adventure is meeting all the people I have met along the way while picking up supplies. People love knowing how their old stuff is going to be repurposed and I love knowing that this “old stuff” is going to have an awesome new home. 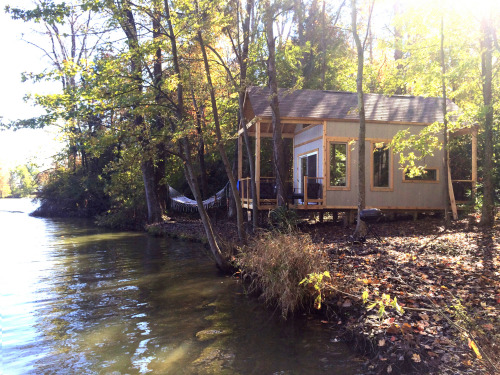 Our cabin is off the grid and powered by a gas generator and will have a water pump and filtration system with water being pulled from the lake. We also have a woodburning stove and are building a stone hearth. Aside from tantrums and bickering among my kids, which obviously makes any project take that much longer, our biggest challenges are time and money. Being a single mom, my time and financial resources are limited. Even though it is going to take a while to finish our cabin, the labor, just like childbirth, makes the reward all the more gratifying. How is it raising a family in a tiny house? I am teaching my children what it means to work for something. And then how to be able to enjoy your hard work when it’s completed. This project is a labor of love, and serves as a getaway from busy city life, a place where we can just focus on being a family and enjoy what life is all about—complete with fishing off our back porch. As for me, well, I’m learning being a single parent doesn’t limit me and my abilities—I can build a cabin! We are a “go get ‘er” kinda family. But also, building small houses becomes a community event and that’s my favorite part about it. What was the most fun part of the process? Every moment we are working on the cabin we are looking at water and getting to take breaks on our hammock or floating dock. Life is simple there, and it is so nice to be reminded of what is truly important. Even if we are sitting among construction supplies, it still feels like we are living a life of luxury, surrounded by nature’s beauty. Where there any big “oops” moments? I had found this awesome window outlet about three hours from the cabin, but the drive was worth it because I was going to get this huge window for a fraction of the cost of buying it somewhere in Columbus. I drove all the way out there and had them load and tie down the 7 foot by 8 foot window on my trailer. I kept a watchful eye on the window and trailer as I journeyed back to the lake and everything seemed fine until about 30 minutes from the lake, I look back and see the window jump up in the air, spin around, and smash into a million pieces along the side of the highway. I was sick to my stomach because this window I had just traveled hours to go fetch was now utterly destroyed, but mainly I felt lucky no cars were around me and the window didn’t fly into someone’s front windshield. I was beside myself, but called the window company and asked if they could make an exception and replace the window as well as deliver it closer to Columbus. I ended up getting a replacement window, the same one as before. Every time I look at it in the cabin, I just am so thankful, but still get a little queasy. If you were doing it again, would you do anything differently? I don’t have as much storage as I would like in the cabin, so I’d like to have a slightly different layout, but aside from that, no. I love the openness and feel of the floor plan. If I had an unlimited budget, I’d make the end walls have more glass. But we are on a tight budget, so I am happy with what we were able to find, such as an eight-foot-wide sliding glass door and a skylight. Will you ever live in the house full-time? If it was just me, I’d totally live here, but I have three young children who need a good school district and neighborhood. Our cabin is a great getaway for us and a place to escape. It has helped put my life into perspective and make me focus on what is most important to me, which is my family and experiencing life to the max. Life never goes as planned and our cabin is a nice reminder that even though life can kick you down and leave you alone, it doesn’t mean that that is how your life needs to stay. My children and I have been through a lot, but we are living a more fulfilling and happy life than a lot of other people I know who, from the outside, seem to have it all. Breaking rules and boundaries is freeing, and proving that to myself as well as my children, is one of the best lessons I can ever learn for myself and teach to them.